Although Twitter did finally add their own Twitter retweet function, many realize that it has several serious drawbacks. San Antonio Real Estate agent Matt Stigliano wrote about them in Why Twitter’s One-Click Retweet Function is Absolute Garbage. So many have complained about it that Twitter co-founder Evan Williams wrote Why Twitter Retweet Works the Way it Does. The major reason I never use Twitter’s retweet function is that you can not see what the Tweet will look like and it often truncates (cuts off) links, Twitter usernames and other important information. A retweet with a broken link is not much good to anyone. I usually use the RT function in the MrTweet Firefox addon (MrTweet). Although I have temporarily disabled MrTweet trying to diagnose the issue with using Twitter that causes FireFox to gray out or hang, I really like their other features. The suggestions @MrTweet sends for Twitter users in your niche are excellent – often really on target (although it does include very popular and prolific Twitter users outside your niche too). I especially like their recommend function. Do your fellow Twitter users and favorite bloggers a favor — write a recommendation at MrTweet that includes why you follow them! CoTweet (CoTweet) is my favorite online way to effectively manage multiple Twitter accounts. It makes retweeting simple and is the easiest way to update Twitter accounts without signing into them. I use it to schedule Tweets for later, spreading them out so they don’t flood followers timelines. You can also send Tweets to multiple accounts. It is a much faster way to manage Direct Messages (DMs). Many of us who have large followings at Twitter pretty much ignore DMs unless you send us an @ message first letting us know to expect something there. The DM spam is overwhelming. There is no way I could do justice to CoTweet for all you can do with it – that would take a separate post just for them. Check out the CoTweet Blog for details on How Businesses Use Twitter or read these posts about Corporate Twitter and How MailChimp Uses CoTweet to get a better idea why CoTweet could be just what you need. I also recommend using Social Too (SocialToo) as a fast way to unfollow inactive accounts when you hit the Twitter follower limits and get that message that you can not follow any more people. Unfortunately, Twitter recently pressured them into eliminating auto-unfollow, claiming their unfollow tool “perpetuates the idea that Twitter is about follower counts”. I strongly disagree with Twitter on this. The SocialToo unfollow function is a relationship tool. It allows us to focus on Twitter users who desire to interact with us and eliminate those who do not. The ability to automatically unfollow is a huge time saver and I for one will sorely miss it. We may have to break down and check out the other Twitter unfollow tools reviewed by ExtremeJohn (ExtremeJohn). I wish Twitter and our other favorite Social Networks like StumbleUpon would listen to input from people like us and read Kristi’s 2010 Social Media Wish List in her Kikolani Social Media blog. 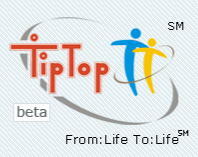 FeelTipTop (Twitter) is a Twitter Search Engine with a one-click retweet, retip and reply functions. TipTop made the list of the Top 100 search engines within months of launching and is rolling out new features so fast I can’t keep up. Use it to quickly and easily pull and read Amazon product reviews and do real time Gift Guide Searches. They even offer an SMS Twitter search function. I recently shared How to Use TipTop For Real Time Market Research. Speaking of lists, have you realized the huge benefits of using the new Twitter lists – especially if you have hundreds or thousands of followers. See the Social Media Guide Mashable (Mashable) for a primer on How to Use Twitter Lists. Check out my Dofollow Twitter List and my KeywordLuv Twitter list (for dofollow blogs only). I also have a list for blogs whose Top Commentator lists are do follow. Twitter lists make it faster for me to zero in on and keep in touch with the Tweets of just those bloggers on each list. Those blogs get more of my time and attention and get shared across Social Media sites far more often. Don’t know what dofollow is? See our post about dofollow blogs. Anyone can follow my lists and do the same. If you have a dofollow blog and/or a dofollow blog with keywordluv enabled, or use a Top Commentator plugin that is dofollow, send me a Tweet to @GrowMap or leave a comment in this post to be added. Interested in a new career? Get Cisco certified more easily. Guaranteed success with 640-863 dumps. No matter what certification you are perusing, using 642-262 dumps and 642-357 dumps ensure your success in first time. Did you know that an easy way to find anything that includes your Twitter username is to search for it without the @ symbol? I keep a saved search for growmap so I can quickly see who is talking to me. You can also Find Twitter Lists by Exploring Tags. I personally like using Social Too, nice easy interface and very easy to use. As Twitter grows even more you’d think that they could come up with some proprietary retweet software that does what it should and not countless excuses! Wwwuuuuaaaahhhhh, good post. I’m still trying to figure out how to use Twitter to convert leads. Very helpful. Isn’t twitter decreasing on members now? I personally hope this is just a hype because all of these twitter retweets and stuff are making me go crazy. Even if it is that doesn’t matter to influencers who use Twitter as their primary means of interacting. That is the key point many are missing – that Twitter is where influencers spread important information to create a better world. These Twitter apps are so amazing:) They make the process of spending time on the Internet much easier! Thank you, Jane. I’m sure many of my readers will be interested in your links. The new update will be important for Twitter retweats! This is going to be a huge thing for webmasters, get as many followers as possible! I believe after new Google update retweets will become more important than ever for SEOers. That mean your list is a gold, man! I’ll be using SocialToo to remove inactive accounts. Thanks for sharing this tool. The thing about twitter retweets on apps is that you don’t only get better ones but it also makes your life much more easier. Wow! This is an amazing post! Here’s another twitter marketing tool software that can help in organizing twitter account. I found this very useful. Better check this out! Did you also see my post on Twitter Tools for Managing Multiple Twitter Accounts? Thanks for this helpful information regarding Twitter Retreats and the recommended apps you have found that work the best. You provide some excellent advice in your article and I will be putting it to good use. .-= Scott @ Free SEO Webinar Training Lessons´s featured blog ..How To Get Listed On Page 1 Of Googe In Less Than 10 Minutes =-. .-= James´s featured blog ..Youtube to Mp3 =-. Your post will help me to increase my knowledge of Twitter. Thanks for the information. I’m using twitter not so long and haven’t tried all its functions. The icons you link to in that pic at the top are outstanding. The growth of people using Twitter is nothing short of amazing. I wish I had thought of it. I am not aggressive twitter user i use four to five days in a week. I say thnak you for making this post after read your post at list i come to know what is Twitter Retweets. Gail, Thanks for the helpful information. My head spins every time I visit your site! I need to focus on a few things at a time. I have sent your site to a few other that will definitely learn here. Also, thanks for Shyam’s comment and your reply of 12 others like you. With so much garbage out there it’s easy to be lead astray. Thanks again! You are correct that there are far too many teaching incorrectly. Some are intentionally misleading others with disinformation and many are simply incorrect but well-meaning. I try to make things as simple yet comprehensive as possible and as you can see that success requires doing far more than most realize. I am working to prioritize what I recommend – to create a map for businesses to follow. i love the appllications.. i will take this. .-= billy´s last blog ..Art of Debt Prevention and Management =-. Good job on this. I’m here thanks to John’s post. ^^ But I’m sure we’ve met earlier in previous blog commenting. Keep up the good work. .-= Ching Ya´s last blog ..7 Productive Things To Do When You Can’t Blog =-. I sent you an email about a potential collaboration beneficial to your business. I haven’t seen a reply but if you answered let me know here and I’ll search more diligently. You don’t have to wait for new posts because there are so many great strategies already here. Scan the categories in the bottom right sidebar (column), skim the Most Popular section (top right) or read the Best of GrowMap. I’m back!!! Do you know how to use TweepML to follow a list that you already know about? Maybe there isn’t a way to do it or maybe I’m doing it wrong? TweepML is awesome but could use some improved usability. If you know the name of an existing list or what type of list it is plug that into the Find a TweepML list box on their home page. To create a list from the Twitter users mentioned on any page, click on their link that says Add TweepML to your Web site and it takes you to Find Twitter Users on a page. Paste the page URL into the box and it creates the list. Save or view the file and you get icons to select from so you can paste them into a blog post or on your site. Gail – you rock on multiple levels!!!!! While @optmeout doesn’t block all the auto-DM’s it does a pretty good job at it. I def get less now than I used to. I use SocialOomph to auto-unfollow those that decide to unfollow me. I have got to check out some of the tools you mentioned – esp the one that lets you auto follow a list automatically. That could be super handy in working with some of my clients’ accounts! .-= Michelle @ Your Virtual Assistant´s last blog ..How to Create a Page in WordPress with No Sidebars =-. Great timing. Jeff at My Local Lookup just asked what else could be used to unfollow and after Feb 1 I need another method myself. Are you sure SocialOomph has that feature? When searching for it I found a post on their site about Why We Should Not Bulk Unfollow and why they don’t offer that option in their tools. Talk to me about TweetMiner. I found an old DM from you to one of my other accounts about it. It looks like a great solution and easier to figure out than CoTweet (so far anyway). It looks like a comparison of CoTweet and TweetMiner are in my future. The list with Twitter plugins is gold for a blog beginner. Autopromotion with this social media website can make your incomes to increase very much. Thank you for the valuable list. .-= Catalin@Sport vehicles´s last blog ..Koenigsegg =-. These are not plugins; they are either online apps or browser addons. I know all that can be confusing – and so can the sheer numbers of Twitter apps. These are the ones I use regularly. Sure, any time. Tomorrow will be quieter than today I hope – couldn’t be much busier! Lots more to share besides what is in this post. Don’t forget to ask me about the SBC forum. .-= Gail @ Social Media Marketing´s last blog ..Are You Playing Hide and Seek With Your Market? =-. Nice timing sweets, this weekend I’ll be hooking up the new blog to Twitter and needing to download or sign up for the best tools before I start…perhaps we can get together and chat about it a bit. Gail – First, thanks for the mention and well done links (love when someone links to the site and knows how to use anchor text to its full advantage). I just finished reading Evan’s post about why they built the RT feature the way they did and although I see the logistics of what they were trying to do, I still think they missed the boat. Commenting is a large part of the social aspects of social media (whether on blogs, Facebook, Twitter, Flickr, etc.) – without commenting we’re back to Web 1.0. The whole concept of socialization revolves around the concept of communication and in the internet world, commenting is the largest form of communication. I don’t want to just parrot information that comes to me via Twitter so others can read it, I want to show them WHY it’s important or what my thoughts on the subject are. It is difficult in 140 characters, but we’ve learned to deal with it. Occasionally, a tweet is so worth retweeting that it doesn’t need comments (if there’s a bad accident in San Antonio and @ksatnews tweets about it, I don’t need to add comments, but I would like my local followers to know – some of which may not follow the local news on Twitter). Until then, I’ll just stick with the old way…manually. WOW! What a list of resources. I think this is why I don’t get enough accomplished in a day. There is just sooo much information out there. Thanks for pointing out JR’s blog. I recently signed up to follow that one. I am about to publish my twitter app of choice, but may have to read your recommendations 1st. Thanks for the homework, now can you add more hours so I can get caught up? .-= CJ Spurr´s last blog ..So You Think You’re a Comedian? =-. This is nothing. There are literally hundreds or maybe even thousands of Twitter apps. These are the ones that save me the most time that I use regularly. One I didn’t mention but will in an upcoming post is TwitterFeed. I use it to send my StumbleUpon reviews to Twitter. JR is also a member of our blogging collaboration. I found three exceptional tools I use regularly through her. I’ll be writing about them here soon and have already posted about them in the forum. Thank you for this awesome post. I didn’t realize there was that many problems with the retweet button from Twitter. I use it, but not so much that I’ve noticed any major problems. CoTweet is something I have yet to experiment with, but I’ve heard so many good things, and after this wonderful post I think I’m going to have to check it out! Good to have you here. CoTweet is a huge timesaver for me, allowing me to send relevant Tweets and links to any Twitter account without signing out of @GrowMap and into the other account. For those who wonder, some of us have more than one account because we manage them for friends or clients or have a Twitter account related to a specific interest like a golf or horse information. Honestly, CoTweet does so much more than I currently use it for that I must make the time to really start using it more thoroughly. When I do I will write a post here specifically about using CoTweet. Do check out the post I featured in CommentLuv in this reply. As an SEO you’ll appreciate what I suggest. It could be useful for your clients (and I don’t offer SEO services so no worries). Thank you, free. Glad to be of service. Wow, great list of resources, will definitely check these out, thanks Gail! Thank you, JR. That is high praise coming from you. What I have learned from your blog is already making a major difference in what I am able to accomplish each day. I encourage any of my readers who are interested in Internet Marketing to subscribe to JR’s blog. You posted this at the perfect time, I plan on writing more posts about Twitter apps and tools. This will be in the next Sunday Smash. Good to know my timing worked out. Thank you for including me in your Sunday Smash. I’ll be sure to come by, check it out and share it. Like nearly all of your posts, this is full of wondeful tips. I would rate you as among the best people in the world today in social media who selflessly share such excellent insights. If there were even 10 more people like you, I would then be even more sure about mankind’s future. I love how you support innovative new things no matter where they originate from. I love how you understand things at a deep level. I love how you then explain them in simple terms so that more people can take the right actions and help themselves. I hope lots of people put in the effort to benefit fully from your insights. 1) Louis Gray, whose futurist tech blog I linked to above. Louis excels at analyzing new solutions and trends and sharing his conclusions with his readers. I highly recommend him. Louis was very generous in linking to this blog when it was brand new and recommending my work to others. 2) Adam Singer is simply brilliant. When I visited his Social Media Marketing blog to find the link I used in this post, I realized how much I have missed reading his posts. He, too, is generous in shining a light on new and upcoming bloggers. 3) Barbara Swafford is extremely generous with her time and knowledge and a prominent member of the dofollow community. She created a blog registry section on her site to benefit other bloggers. I highly recommend hers as a great blogging community to join. The only reason she wasn’t already linked in this post is that she didn’t have a recent post about Twitter. 4) Kristi Hines aka Kikolani needs no introduction to most. Besides her blog she is also know for her article writing. Anyone interested in Social Media should check out her best Social Media posts. 5) Without the expertise and generous heart of Derek Semmler, our very own WordPress Ninja, this blog would not have come so far so fast. Our joint venture blogs about golf, personalized gifts would not exist and we wouldn’t be adding two more about horses and healthy living. 6) Although he is extremely busy, Marty Weintraub has shared his genius for expert blogging and especially expert SEO through one of the very best Search Engine Marketing blogs. If you want cutting edge or very advanced information don’t miss it. 7) Although I only recently “met” JR I have already found several indispensible tools through her including a thriving community for submitting and finding guest posts and the Best Content Spinner ever. I am new to using article marketing so her experience really sped up the learning process. 8) Collaborating with Murray Newlands has allowed me to achieve goals faster. Anyone seeking Blog Consulting Services or wanting to learn more about Word of Mouth Marketing should look him up. 9) Connie Foggles has been a joy to work with as co-moderator of Murray’s Blog Club. She has a very active Product Review blog where she writes about products of interest to parents and families. 10) I have learned so much from working with Bill Sutton who owns Good Millwork, a Florida based manufacturer of architectural moldings and exterior shutters. Both that blog and the one that hosts his molding search tool are dofollow and feature CommentLuv and KeywordLuv. 11) I only recently started working with Eric Blackwell and know we will accomplish much together. He is involved in Louisville Real Estate, offers Search Engine Marketing Services and has a site with Autism and Asperger Syndrome. 12) I met Adam Riemer through Murray and recommended him to my favorite personalized gifts store owner. Adam is the most passionate, ethical merchant affiliate manager I have ever met. I am thrilled we are now working together on their behalf. My greatest fear is that I have left out someone who truly deserves to have been mentioned. It is late (early a.m.) and I am tired so I hope that if I did leave someone out that they will forgive me. It is likely I will add them later when I remember! Thank you Gail so much for the mention, I appreciate it. Make sure to come over and check out my Comment Luv blog list, you are definitely at the top of that list! Well deserved, JR. Do you have any idea how important what I’ve already learned from you will be for everyone I assist? You probably do. I really appreciate you taking the time to share your experience with me. Thank you so much for including me in your new post. I am definitely going to be checking out your list of CommentLuv blogs.